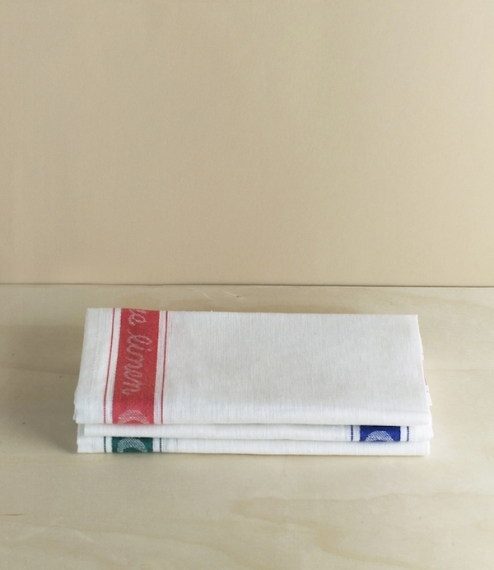 Glass cloths manufactured in Lurgan, Northern Ireland, from 95% linen and 5% cotton (the stripe). Linen tends not to shed its fibers so is considered lint free, and is both faster drying and more absorbent than cotton, for which reasons it was traditionally used as a glass cloth - leaving neither smears nor fibers on crystal. More generally they make the finest all purpose drying or tea towels. Available with blue, green, or red stripes, all approximately 74cm x 50cm.